We’ve been suffering from meteorological whiplash. We had snow on April 23 and a low of 22 (-5C) on April 25 . Thirteen days later it got up to 88F and we’ve been sweltering ever since. The Roadside Yellow daffodils that I planted last fall have been delivering their sunshine almost as soon as the snow melted. They are an early blooming variety with strong stems and just about every single one sent up two blooming stalks. My daughter cut over five dozen of these daffodils for the house and I didn’t even realize they were missing until I went inside and saw three generously filled vases. I should mention that my friend Nicole and I didn’t plant them as close together as Colorblends recommends. It was just too difficult in the rocky, clay soil. 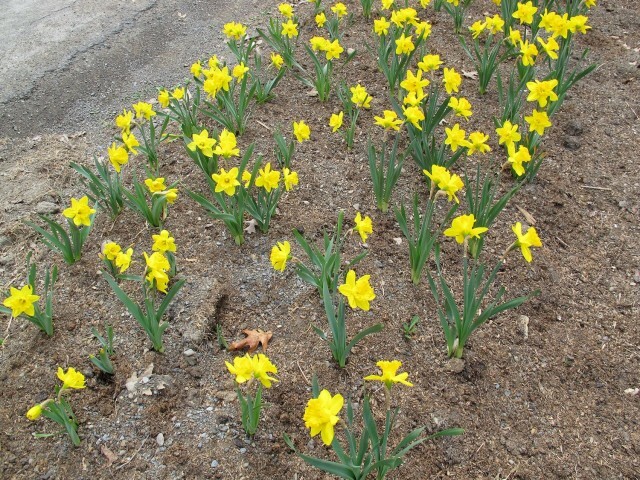 These daffodils were planted further apart than Colorblends recommends. If they had been planted at the recommended density, they would have filled the space along the roadside. Instead, I found myself with several dozen left over after the roadside was planted, so I just continued planting down the walk. The daffodils not only line the roadside, but they continue down most of the walk as well. I still think they make quite a splash, don’t you? My daughter cut so many for the house because we were afraid they would shrivel up in the heat, but they held up surprisingly well. Of course, they would have lasted longer if we’d had cooler temperatures, but other daffodils that started blooming later turned brown sooner. 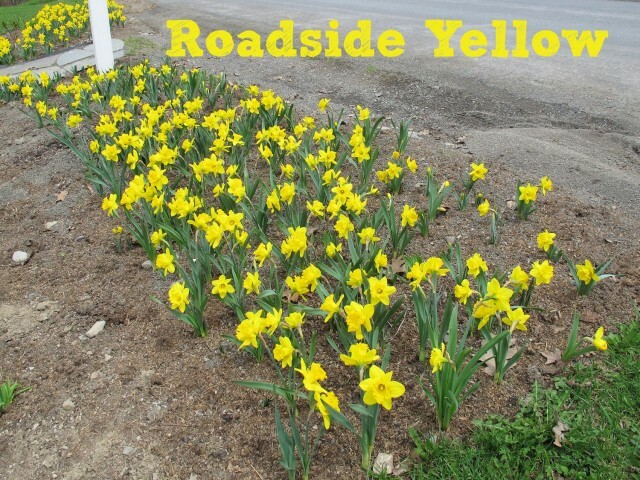 In general, Colorblends bulbs cost more per bulb than many other places, but based on my experience with the Roadside Yellow mix, they are well worth the extra money if you have a large area you want to plant. 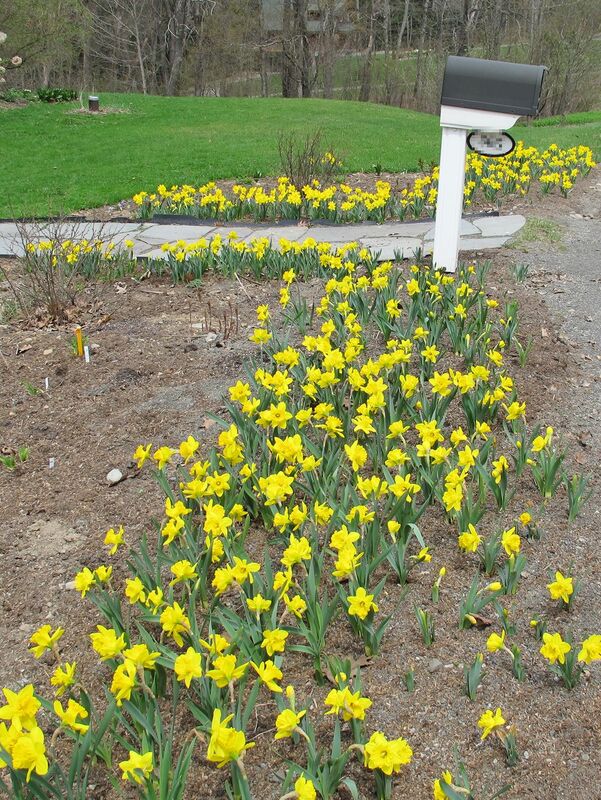 Disclosure: I received 500 daffodil bulbs from Colorblends last fall. This review is based on my experience planting and growing the bulbs they sent. Kathy, do you have a favourite daf? I would love to put some in here at LacLeJeune B.C. Asking me if I have a favorite daff is like asking me if I have a favorite child. I have lots of favorites! How were you planning to use them in your garden? Daffodills look really nice planted spaced out like you had done. Looks greyt. Beautiful! Do you have to ammend the soil a ton because of salt from the winter on the road side or do they do ok? Matt, good question, but I don’t have an answer for you, because while we get a lot of snow, our town just plows the road and doesn’t use salt. So this hasn’t been a concern of mine. Wow. These look beautiful. I’m still waiting for my daffodils to pop up here in Ontario. 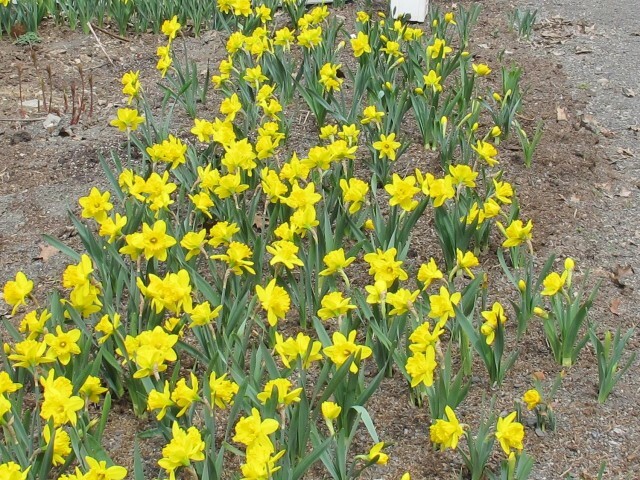 I’ve seen other yards full of them – wondering if the squirrels got to the bulbs last fall without me noticing…. Squirrels don’t normally bother daffodils, Jacqui. But if you cut the leaves off or tied them up at the end of last spring, that might keep them from coming up. We have tons of these around our neighborhood as well – it’s always a nice surprise when they pop up every year! Thanks for sharing! I agree Kathy they make a wonderful display and even more so as they extend up the walk. I found many of my daffs wilting sooner this year due to the heat, but they bloomed long and large. Meteorological whiplash, indeed. On Friday I saw a forsythia and an early lilac blooming side by side. Huh? I enjoyed sniffing my late daffodils this evening. Tomorrow, for all I know, they will be fried. I debated between meteorological whiplash and horticultural whiplash, but since the weather whiplash caused the gardening whiplash, I decided to name the cause and not the effect. Yes, sniff your late daffodils. The apple blossoms have opened here, and I am inhaling their sweet fragrance. Of course, since they have opened, there’s a good chance of frost on Wednesday. Kathy, they look terrific. I like seeing them along the road and up the walk. How cheerful!! So that’s why my daffodils didn’t seem to last as long – heat! It’s been summer here and very little rain. But this week should change. I have a mix of daffodils so some are just coming into bloom but you know I didn’t mix those well with the early bloomers so I have large patches of dried up daffodils now. It doesn’t matter – I thoroughly enjoyed them all! I enjoyed your sunny side of the road, too. I think over time they will fill in and before you know it you’ll be saying I have to divide those daffodils! Ha ha. Looks like you hit the jackpot with your selection of this variety. Hopefully, they will multiply and next spring will provide an even bigger and much appreciated show of blooms.